Bourges Basket and Tarbes Gespe Bigorre led their LFB Championship play-off series. However the main basketball news was the news about the roster of Villeneuve d’Ascq for next season. Laurie Datchy, Jolene Anderson and Lady Comfort will remain at Villeneuve and will be joined by Elodie Bertal, Ana Cata-Chitiga, Emilie Gomis, Carine Paul and Ingrid Tanqueray. The match failed to live up to its billing as the supporters from Villeneuve d ‘Ascq left the hall after the game very disappointed with the way their team played. 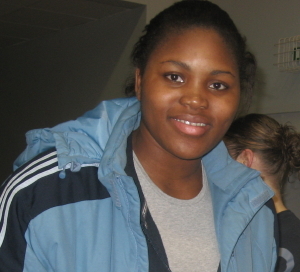 For Tarbes Isabelle Yacoubou-Dehoui (left) was the match winner with 26 points and 13 rebounds. She also had the opportunity to show off her skills in connecting from beyond the arc. Tarbes led (22-9) after the first period but then struggled in the second period and went into the interval with an advantage of just 1 point (30-29). After the break Tarbes took control and with 28 minutes played they led by 16 points (53-37). Villeneuve d’Ascq reduced their deficit slighty by the end of the third period (44-57) but had lost all chance of winning the game when they trailed by 22 points (50-72) with five minutes to play. Villeneuve: Lepron 4, Anderson 12, Robert 14, Sacko 12, Comfort 6, Datchy 8, Drljaca 2, Evtoukhovitch 5, Albicy. Tarbes: Eldebrink 9, Wright 15, Moeggenberg 5, Jansone 15, Yacoubou-Dehoui 26, Tzekova 2, Arrondo, Castets 5. Montpellier’ aggression at the start of the game allowed them to gain the upper hand to lead (12-5) early on. Bourges Basket finally found a way to stop the onslaught of their hosts as the teams cancelled each other out for the rest of the quarter. Nwal Endéné Miyem from Bourges Basket broke the deadlock with a three-pointer and last points of the first period with 20 seconds (8-12). Sheana Mosch and Aurélie Bonnan went to work offensively at the start of the second period for Montpellier to go further ahead by 13 points (24-11). With Katrina Manic and Miyem scoring they managed to keep Bourges in the game as Montpellier went into the locker room with a reduced advantage (30-22). Montpellier did not get to the free-throw line in the first half of the match but quickly corrected that at the start of the third period with Alexia Plagnard and Mosch scoring free-throws. However this was not enough to keep Montpellier in the lead. Ana Lelas and Céline Dumerc's three-point shooting gave Bourges the advantage for the first time in the match (39-38). Bourges Basket stretched their advantage (41-38) going into the final period. Bourges were unable to distance themselves from Montpellier as Kadhija Whittington and Gaelle Skréla battled offensively to bring the two teams level once again (42-42) with 33 minutes played. The game became became more technical as both coaches turned the game into a chess match. Bourges finally gained the upper hand as Lelas and then Dumerc connected once again from the three-point line (50-42) . With two minutes left to play, Montpellier had no choice but to attack. Their efforts almost paid off as they reduced their deficit to 3 points (48-51) with 26 second left to play. The final scoring came from the free-throws as both sides made one visit each. 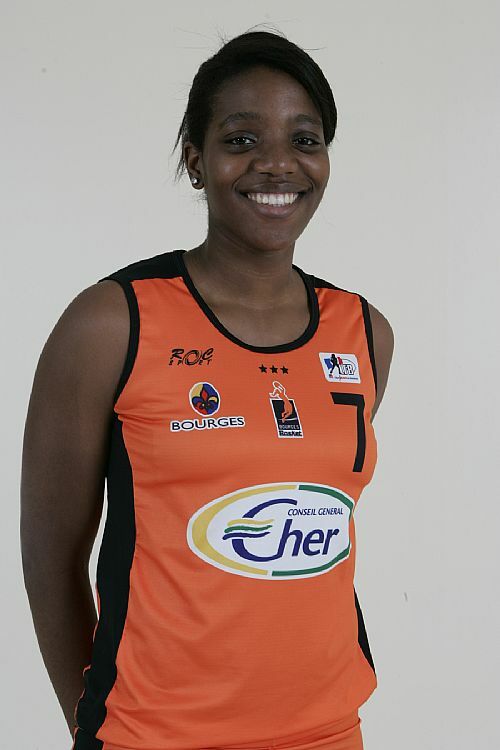 Bourges won (53-50) with only Miyem in double digits with 14 points. Mosch and Skrela scored 13 and 10 points for Montpellier.